When Damian Sansonetti and Ilma Sanchez moved to Portland, Maine last fall, their plan was to open a restaurant. They didn't find a location right away, so in the meantime, Damian put on a series of pop-up dinners, the couple had a baby, they personally built out and opened a unique sandwich shop (The Blue Rooster Food Co., on Dana Street), and then, in September, they launched Piccolo. Piccolo isn't exactly the restaurant that Damian and Ilma pictured when they moved here—it's much smaller, for one—but the space became available, it had great features that didn't take much work to re-imagine, and the opportunity felt right. So they jumped in and added it to their list of achievements. Damian, the former executive chef at Bar Boulud in New York, had spent many years working with French cuisine, French aesthetic, and French ingredients, and he was ready to explore new territory. 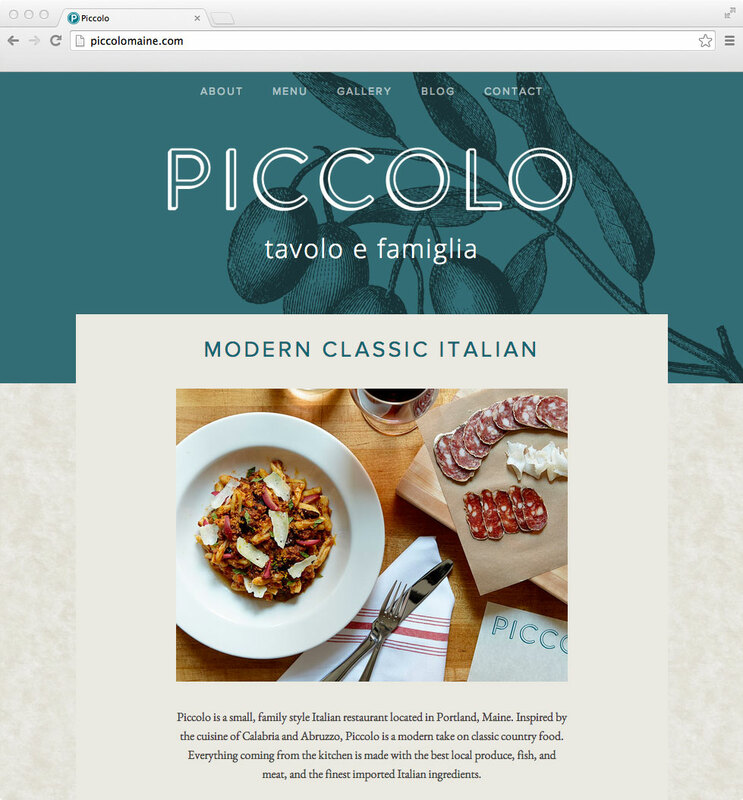 With Piccolo, he looks to his familial roots in the south of Italy. 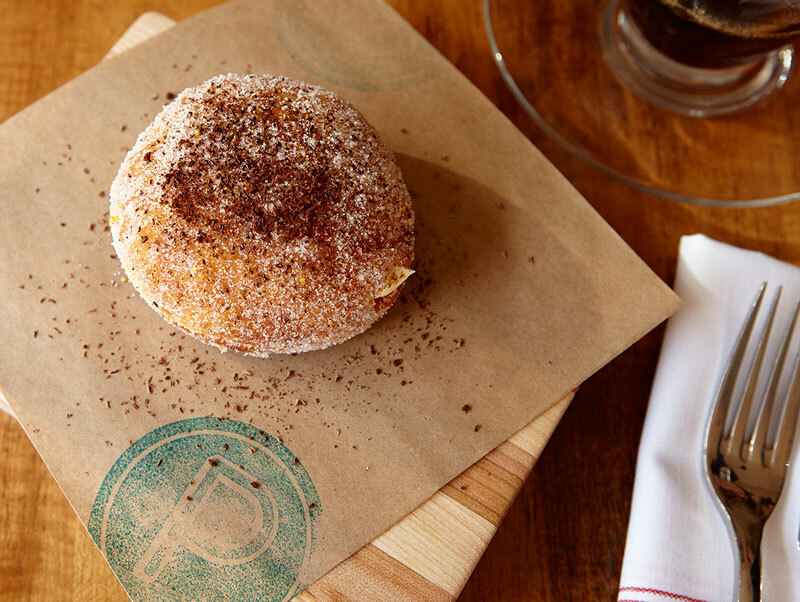 Piccolo's food would be simple, fresh, and comfortable. The aesthetic would be Italian country farmhouse, with just a hint of a contemporary edge. 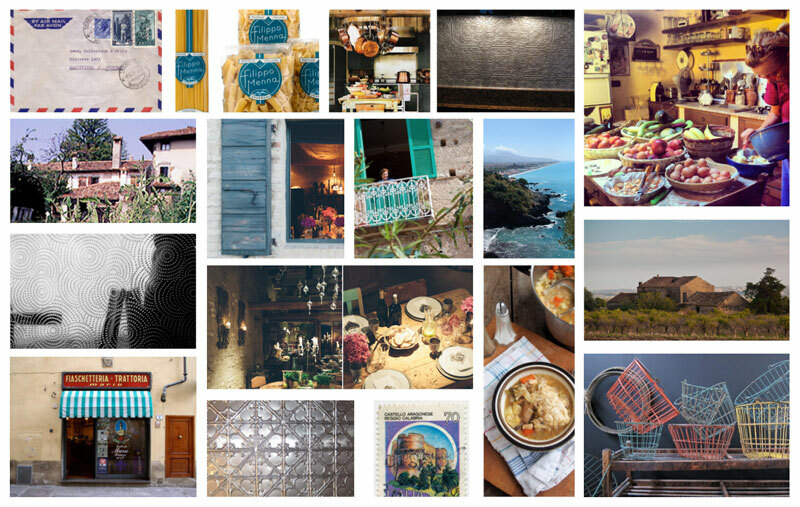 Local sourcing was crucial, but a few key ingredients would be imported from carefully selected producers in Italy: olive oils, fresh-caught mediterranean sardines, bergamot oranges, and bitter amaros. Studying photos of Calabria and Abbruzia, the regions of Italy that would most inspire the food itself, we noted the vivid teal hue of the sea. When Damian and Ilma found an antique shutter in nearly the same shade, it became a cornerstone of the brand. We wanted the logotype to feel clean, sparse, perhaps with a classic Italian Art Deco-era feel. We knew we needed to turn around signage quickly, so we sourced readily available solutions and found a manufacturer of cast bronze letters that were available with a green patina that fit our palette. Adjusting the sign installation template to match the logotype's kerning. For quick delivery, we chose from in-stock lettering, and then based our choice of typeface for the logomark on finding a close match to the metal type. We found one in Brandon Grotesque, made a few tweaks to bring it closer to our metal type, and then generated inline and shadow versions that would evoke the metal sign's dimensionality. Menus would be printed in-house and on-demand. We pre-printed the logo, along with faint reproductions of botanical engravings, onto a parchment-style paper. They are printed without bleed on standard, letter-size paper. But cutting the sheets in half for final menus produces an unexpectedly diminutive form factor and provides the effect of images that both wrap around the page and continue from one menu to another. Postcards and business cards complete the small suite of printed materials and carry on the limited color scheme and wrap-around, overprint image effect established on the menus. A rubber stamp of the 'P' monogram allows Piccolo to brand other items, such as gift card envelopes and food wrappers. Piccolo's website continues the visual themes present in the printed materials. The execution of the Piccolo brand was informed by the speed at which the brand needed to launch, the casual simplicity of the planned aesthetic, and the tiny size of the physical space. Everything needed to be authentic, simple, and small. Decisions were made quickly, intuitively, and responsively. The result is cohesive-but-simple, understated-but-elegant brand materials that are easy for Piccolo staff to integrate into the space and work with every day. With such a powerhouse first year in Portland, we can't wait to see what Damian and Ilma take on next!